Apex Launcher is offering users a free upgrade to the Pro version. This appears to be a limited time offer and is only a local upgrade for the free app. We think that Apex Launcher is one of the best Android launcher apps out there here at Android Authority. We know a lot of you love it too, but for those that haven’t given the long-serving launcher a go you can now jump from the vanilla Apex Launcher to the Pro version completely free! 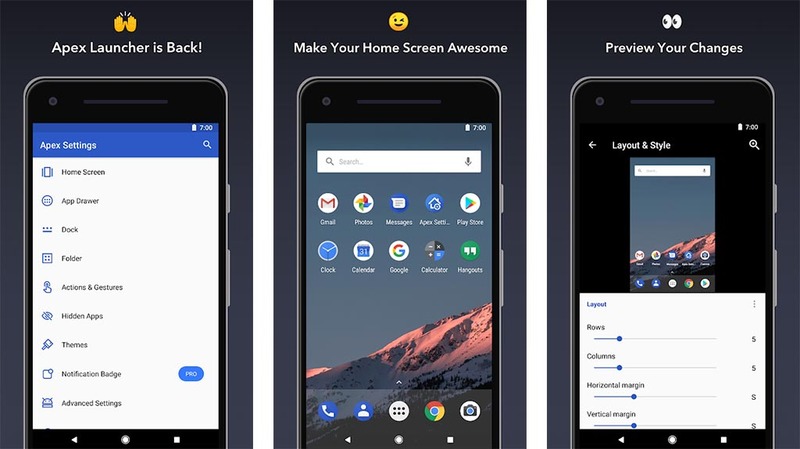 For a limited time (although we don’t know how long exactly), anyone who downloads the regular version of Apex Launcher from the Google Play Store can now access all the extra premium goodies like icon gestures, enhanced folder support, advanced widget options, and other customization features without having to pay the usual $3.99 fee. All you need to do is install the app, open the app settings either via the Apex Settings icon or by long pressing on the homescreen, tap on the Pro Free badge and then restart the launcher (thanks, AppSales). There is one small caveat, however. As you’re not purchasing the main Apex Launcher Pro app from the Play Store, the free version is essentially acting as a local license key. That means the Pro version you’ll have is only unlocked locally, so if you switch to a new phone or reset your current device you’ll lose all the Pro features. Regardless, this is a great way to try out Apex Launcher’s advanced feature set for free without any downside. If you do change phones and miss the extra options, you can always upgrade then and you won’t have lost a cent. Hit the button below to download Apex Launcher today and let us know your thoughts on the launcher in the comments.